The prediction of what would happen with the election of Republican control of our federal government and healthcare reform moving forward discussed in the last Pulse article seems to be accurate. Nothing extraordinary or extreme will actually happen rapidly; repeal with gradual replacement seems the safe way forward. Although there is a minority of Republican legislators, notably the Freedom Caucus, demanding immediate repeal and replace, it appears that the majority of Republican legislators are determined to get reform right. I do not understand why Republicans do not have a replacement plan for the Patient Protection and Affordable Care Act (PPACA, PL 111-148) on the shelf (they have had plenty of time) but I am heartened by House Speaker Paul Ryan’s commitment to have a bill for consideration this spring. My guess is that the majority of Republican legislators were not counting on having a Republican president this election cycle. For full disclosure, the House of Representatives has over the last 6 years passed many PPACA reforms and replacement bills that have not gotten out of the Senate due to Senate rules combined with the reality that the previous president would veto any changes to Obamacare. Some of the dire predictions of the pre-PPACA vote have come true: costs rose, health insurance plans changed, access to your physician remains limited, quality continues to be an elusive metric, and competition among health insurance plans in the health exchanges is decreasing. Even President Obama stated he would be for some changes to the present system to make it viable. When healthcare reform began back in 2008-2009 there were 30 million uninsured or underinsured persons in the country. By December 2009, it was quoted that up to 50 million Americans were uninsured or underinsured. Since the passage of the PPACA, we have insured around 20 million persons which leaves 30 million still uninsured or underinsured. Of the 20 million people insured, 12 million are insured by the expansion of Medicaid. The other 8 million people have heavily government-subsidized plans. Now is the time for thoughtful and deliberate consideration and passage of comprehensive reform for financing and delivering medical and health care in the United States. There is ample evidence that the financing part of the PPACA is not working well. There is more than one way to finance care and there is certainly more than one way to deliver care. I believe we should allow for an alternate proposal to be considered. Without changes, the present cost of the PPACA will continue to burden the taxpayers moving forward. Everyone, including most Democrats understand that the PPACA needs significant changes to survive. 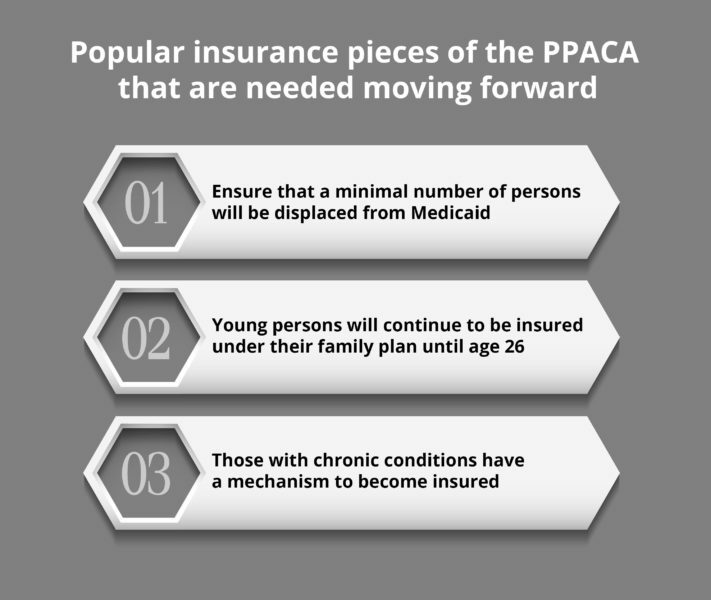 What are the basic popular insurance pieces of the PPACA that are needed moving forward? Replacement will be elusive and politically undoable without a way to ensure that a minimal number of persons will be displaced from Medicaid, young persons will continue to be insured under their family plan until age 26, and those with chronic conditions have a mechanism to become insured. Understandably, the above referenced prerequisites are expensive and will need a funding mechanism. 1. Medicaid has a state-matching portion that was totally funded under the PPACA for three (3) years. It is decreasing to 90% federal funding with the remainder being picked up by the states. While coming up with 10% matching of the expansion funds seems miniscule, most states have tight budgets and adding an additional $30 to $50 million-plus line item is challenging. This is also another unfunded mandate by the federal government that angers many state lawmakers and is contrary to fundamental conservative lawmakers’ core values. Republicans’ answer to Medicaid is to supply a finite amount of money (block grant) to the states, remove regulations and restrictions, and allow each state to finance a plan to provide care to the Medicaid eligible in their state. I do not understand why this state-centered concept is unpalatable to Democratic lawmakers. Some states have been granted some leeway (or waivers) to experiment with different delivery models. State experimentation and innovation are needed and should be encouraged, not limited and regulated. 2. The 26-year-old dependent on family plan is a great idea, has great mass appeal, and is an added cost to the system. As a health insurance consumer, I know that the family plan premiums seem to be large enough to include these young healthy individuals in our present system. Just how much of a cost the coverage of 22- to 26-year-olds are to insurance companies would be interesting to explore and may be the subject of a more pointed article. I know that my personal burden on the insurance industry from age 22 to 26 was non-existent. Those were the days where I was bullet proof, invincible, immortal, and healthy however later in life, as a father, one of my three kids had a cost-consuming disease between the ages 22-26. For American families, this is an extremely popular provision and serves as a backstop for unforeseeable catastrophic diseases of young persons. 3. The chronic disease portion of healthcare spending is the major driver of spending and the key to controlling costs and providing quality. Those persons with one of or any combination of chronic diseases (obesity, hypertension, diabetes mellitus, heart disease, and arthritis) consume a significant amount of healthcare spending dollars. Looking at several articles on the cost of chronic disease shows that the top 5% of the population with chronic medical condition(s) consume up to 50% of the healthcare dollars. This is in contrast to 50% of the population who consume less than 5% of healthcare costs (as low as 3%). One can easily see the impact coordinated concentrated care on these chronically ill individuals will have on the national healthcare spending. Although some chronically ill people are sick through no fault of their own, some chronic diseases are directly impacted by unhealthy lifestyle and nutritional choices. Coordinated care can follow, monitor, and suggest healthy lifestyle and nutritional choices. How can the government or physicians make a significant impact on individual decisions about lifestyle and nutrition choices? There will be ample opportunity to discuss and debate the path forward. Hopefully, all alternatives will be honestly and openly explored. I am sure that all the doom and gloom predictions that were present in 2009 will be present in 2017. This time around any bill presented for passage should be explained and debated. We should not return to the days of “pass it to see what is in it” healthcare reform. I did not and do not believe that the PPACA is as successful or as effective at reform that can be made available to the American people. There has to be a better way, a more effective way, and a more cost-effective way to finance and deliver quality care to our citizens. We all should be open to new ideas and proposals or old ideas that are improved upon. As alternatives become available, they will be explored.